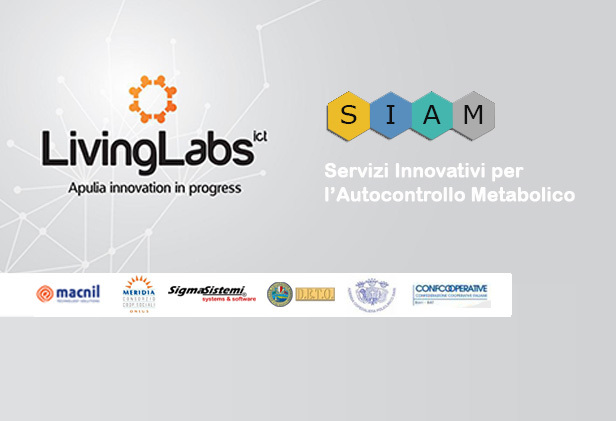 On Wednesday, November 5, 2014 was held the SIAM Workshop Project (Innovative Services for the Self-Metabolic) at the Library of St. Teresa of Males- De Gemmis De in Bari (Strada Lamberti, 4). The project is implemented in the context of Living Labs Smart Apulia Apulia Region from 2020 Macnil Consortium Meridia, Sigma Systems, DETO in collaboration with the Hospital of Bari and Bari Confcooperative-BAT. The Living Lab SIAM aims to develop an innovative social health to reduce the risk of metabolic syndrome and diabetes, through the real-time remote monitoring of parameters practitioners. It is based on the exploitation and processing of original biomedical data resulting from self-cholesterol, triglycerides, blood sugar through the use of one or more biomedical sensors and a smartphone. The aim is to facilitate the diagnostic and therapeutic with the direct intervention of social cooperation. A model taking care of people with chronic conditions. In addition to the intervention of the Project Partners, participated in the Workshop: Mr. Marco Lacarra – Head of Smart City Municipality of Bari, Mr. Gianfranco Visicchio – President Consortium Meridia, Mr. Nicola Lavenuta – Macnil Zucchetti Group CEO, Mr. Piero Rossi – Chairman Confcooperative Bari and Mr. Vitangelo Dattoli – General Manager in Bari. Click HERE to download the Agenda of the Workshop of the Project SIAM (In Italian).